Why Use a Pediatric Fellowship Personal Statement Writing Service? Pediatrics is a specialty where competition for fellowship posts is strongest. Qualifying to provide medical care for children is a demanding and long term process. 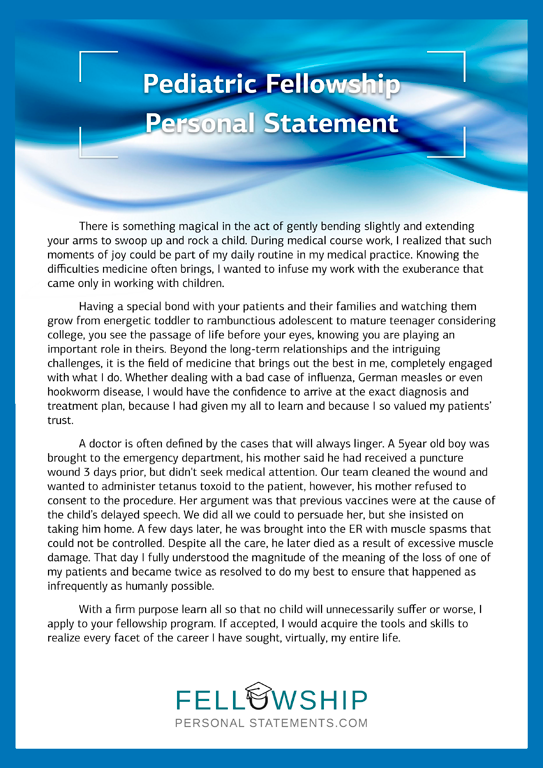 Your pediatric fellowship personal statement is an important step in showing you are qualified and committed. Your personal statement for medical fellowship must be top quality. It should stand out from others and get you invited for interview. It must read very well, be totally grammatically correct, show precisely why pediatrics is your desired specialty, and promote you as the most outstanding candidate. To meet this, many people are going to choose our professional writing services. Our staff will write your anesthesiologist personal statement as required for your particular fellowship application. They know that the selection board will only invite high quality candidates for interview. Writing a personal statement which portrays you as such is not an easy task. Our writers will draft a unique personal statement based on your supplied information. The intention is always to show that you are motivated to be a pediatrician and you have the knowledge and skills to excel in the field. Details of your studies and internship. A pediatrician needs a foundation in general medicine and you must show you have it. Why are you applying for a pediatric fellowship? You may have a strong interest in a research project or sub field such as pediatric oncology or cardiology. You may simply be gifted in communicating and working with young people. Your career plan? Show you have a firm plan for using the knowledge you gain during the fellowship in your working life. Why you chose the particular school or hospital? You are attracted by their reputation, interested in their research topics, or simply wish to live in a certain area. Indicating why you want to join their team will increase their interest in you. Educated to handle any academic level requests (even PhD). Experienced in writing high quality personal statements. “I have always been an organized and the type of person who seldom does anything without a plan. During high school I had already decided on a career in medicine. Before I completed my first year of college I had mapped out my entire medical career. I not only knew where I wanted to go to medical school. I had also decided on residency training, and where I would practice medicine once I finished my residency. Making a plan and sticking to it has always been one of my strong suits, and is something I take pride in. At this time in my residency training, I find myself deviating from a plan that I have strictly adhered to for almost my entire adult life. Rather than being upset or discomfited as I would have expected, I am exhilarated and find myself more focused than I have ever been. During my resident training, a portion was spent in a dialysis ward. One of the patients I encountered there was only a child. I have come into contact with many children during the course of my studies, many of them quite ill. This time, although there was nothing particularly notable in the situation, it brought me to the awareness that with my current training and by altering my plan, and applying for a fellowship in Pediatric Nephrology, I could do something positive about the situation. For the past year I have been contributing my free time to doing volunteer work in the children’s dialysis center at City Hospital. I have not lost my penchant for planning, and through my volunteer work, I have determined that Pediatric Nephrology is where I want to focus my efforts and not a passing fancy. While I have learned a great deal during my residency training and through my exposure to the field while volunteering, there is much more still to be learned. Having supplied you with a sample statement, and received your desired data, your assigned writer will prepare an original statement and have it proof read. You will receive it before your deadline. The statement can be revised as often as you like. If you are not satisfied with our service, money back is guaranteed. 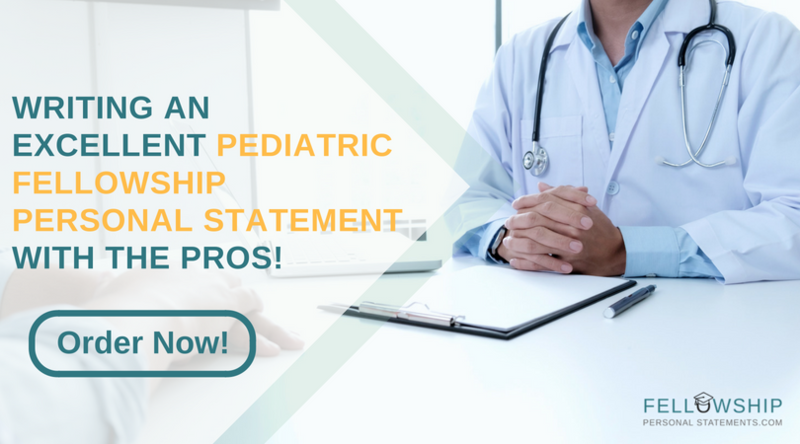 For the very best pediatric fellowship personal statement just contact our experts here online today!